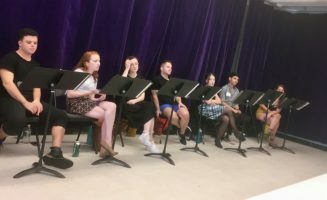 Grace and New York City – CPA Theatricals, Inc.
Our last reading of GRACE & THE ISLAND OF MISFITS happened in New York City a couple of weeks ago. Now, I had never organized a reading in NYC, so I had a lot of logistics to work out. And, I was doing it all from Chicago. I had to hire the actors (thanks to Simpson Longthorne Theatricals and Madison Kauffman we found very seasoned actors…some with Broadway credits! ), rent a room, arrange for a musical director, find/buy binders and make copies, arrange food for the actors, find places for meetings, and figure out lunch and dinner for the composing team. Somehow it all came together. Actually, I had help from my irreplaceable Associate Producer, Tim O’Connell, and a magnificent stage manager, Jim Radloff. And, my contacts in NYC really came through. 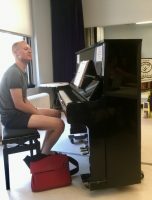 The amazing composer Christian De Gre found us a meeting room (with AC nonetheless) for a pittance, and Theatrical Rights Worldwide helped out with binders, etc. Then, the day of the reading arrived. And, just then, I received a text from a producer saying he wanted to join us for part of the reading. Since we are in talks about him producing the show at his theatre in Florida (and I knew the newly created music at this reading was outstanding), I invited him to join us. All of the actors arrived at one time, completed their paperwork and immediately sat down and started reviewing the material. You could hear a pin drop in the room. I was a little startled at first, but then realized they were all concentrating. By then it was time to start the rehearsal. I gave a few words of instruction and information, and then the composing team and I left the room. When we came back about two hours later, we ran through the new material. I heard the three newly created songs for the show and I was blown away. The script was spot on, and the lyrics were critical to moving the plot forward. The composing team taped the big ballad and it was glorious. A few days after I returned from the reading, I shared that recording of the beautiful ballad (it is about the misfit toys dreaming of finding a child for them to love) with a handful of colleagues. And then something miraculous happened. One of the colleagues got back to me and told me she wanted to record it. I guess I’d be flattered in any case, but she is an experienced performer with a stellar list of credits. And SHE wanted to record it. I told her that we were still working on the song and that it was not ready. “Then let’s just do a demo,” she said. “And don‘t worry about the fact that it’s written for all the toys to sing. I’m hearing it as a solo! Please let me record it!” Now, that threw me for a loop. I called the composer who was thrilled and he said to proceed.